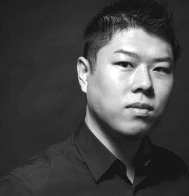 Wayne Chang is a serial entrepreneur and angel investor. His last company, Crashlytics, was acquired twice -- first by Twitter and then later by Google. The average app loses 77% of its daily active users within the first 3 days. The message from users is clear – you have to earn the right to more of their time. Users are simply not willing to give your product another go if they aren’t initially impressed, which is why focusing on creating a Minimum Value Product (MVP) can lead to lackluster results. While the goal of the MVP is to get something barely usable out the door and into the market for initial feedback, the Minimum Lovable Product (MLP) approach emphasizes the first time user experience as key to reduce churn. In other words, the MLP focuses on making your users fall in love with your product at first interaction. Let’s dig right into the strategies you need to build an unforgettable first-time user experience that will have your users coming back for more. Although cliché, first impressions of your onboarding experience are critical in user experience design. A user’s first interaction with your product offers them a glimpse into what they can expect to experience if they continue to use your product. With only 23% of users sticking around after day 3, it’s critical to put in just as much thought and intention into your onboarding experience as you put into your final product. This is why onboarding a new user is a privilege – you have the opportunity to shape the perfect first experience for them. Follow these tactics in order to create a delightful onboarding flow. If there is one thing you remember from this article, let it be this – you should only ask for the information you need in that moment. Users are new to your product and can become easily overwhelmed if you ask for too much information at once. Just like how this guide is broken down into sections, users need information to be broken down into smaller, digestible steps. By easing your user through the process, you’ll increase the likelihood that they complete the onboarding process and, in turn, have a pleasant user experience. For instance, check out the gif below. This is Facebook’s analytics instructional page for developers. Throwing all this information at once to a user is too much information for them to process and makes for a bad user experience. This is too much information! In order to properly engage your user, you need to make them feel like they are a part of your product’s story – or rather, that your product is part of their story. Don’t just throw them into an empty dashboard or make them wait for something to happen. It’s your job to teach them how your product works and show them the bright future that lies ahead if they continue to use your product. For example, AND CO, an invoice company for freelancers, onboards users by adding tasks to their dashboard. 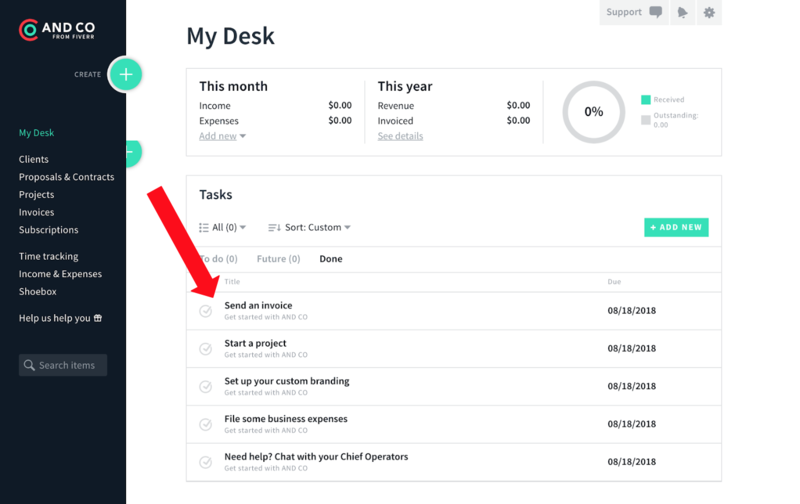 When you click on a task, it explains the feature through short, easily comprehensible text and images, and then has a clear call to action to encourage the user to try it out in the moment. A dashboard with a list of tasks for first time users to complete. 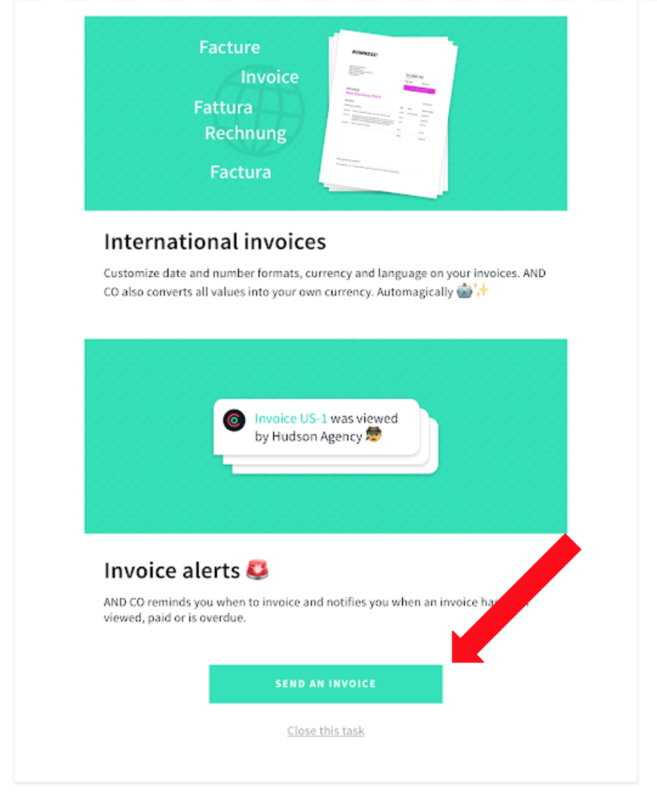 "Send an Invoice" is a clear call to action to engage the user right after they sign up. We did something similar at Crashlytics. As part of the onboarding and first-time experience, we created a fake, blurred out dashboard filled with charts to show what the product will look like once the user is all set up. We also added a nice personal touch by animating the user’s logo on-screen. Details matter. This animation of the user's logo adds a nice personal touch to the experience. Users are very aware of time — how they spend it, how long things take, and the relationship between the amount of time they’ve invested and what they’ve gotten in return. Because new users aren’t familiar with your product yet, they will be quick to churn at the smallest infraction, as they are trying to decide as quickly as possible if your product is going to make their life easier and more efficient, or slower and more boring. But perception of time is very subjective, and if you pay attention to details, you can have positive influence over it. 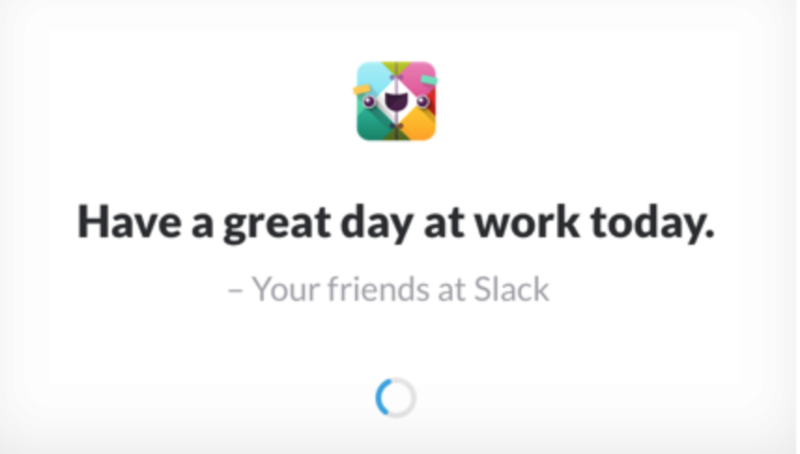 Boring and often overlooked things like waiting for a dashboard to load are perfect opportunities to delight and to make the user forget that they’re waiting. Tips for the product: When a new user first enters the product, it can be extremely helpful to give them indicators on where things are and how it works. But this can also be a tactic for continuously keeping them engaged as they continue to use the product over time (as long as it’s done strategically and doesn’t become an annoyance). 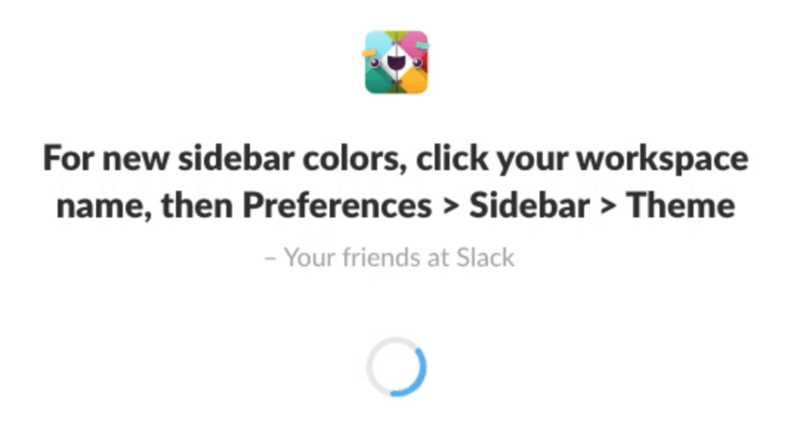 Slack adds tips to their load screen. "Did You Know? ": Loading screens are an excellent place to put quick, interesting facts relevant to the product or its use case scenarios. Quotes: This can be a great way to “humanize” your interface. Add quirky quotes and friendly messages to take your mind off the fact that you’re waiting for the platform to load. Animations: Loading animations, especially, can help a user feel as though they’re witnessing something creative or unique unfold right in front of them — instead of feeling like their time is being wasted. Follow-up sequences: Even when your user is away from your product, it is still an opportunity to delight. For example, you can send your users beautifully designed emails with impromptu updates about their accomplishments relevant to your product. For example, “TL;DR — your app was 98% crash free this week”. This positive reinforcement makes them feel great in the moment, and gives them even more reason to come back and continue using your product. Example #1 Standard 404 Error. 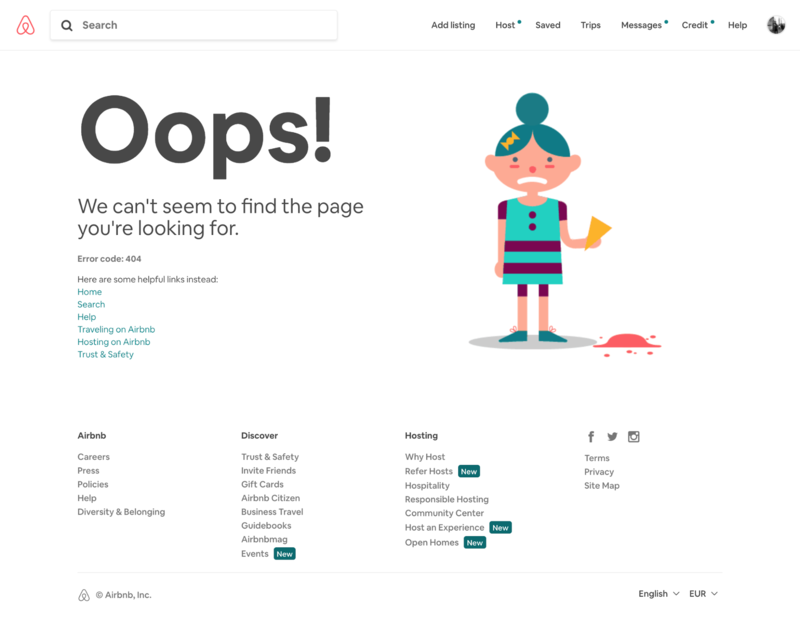 In sharp contrast, Airbnb’s 404 error page is much friendlier. The character on the right acts like an acknowledgement of the frustration the user may be feeling and the copy on the left provides a clear path for what the user should do next. Most people would agree that Airbnb’s error message is less jarring than the first 404 error example. When writing your copy, ensure that your copy is friendly, especially when things go wrong. It will lessen the impact of any negative interaction, make the user feel more engaged and more likely to forgive. If you’ve invested time into creating a lovable, first-time user experience, then your users are going to tell someone else about it, and that person will try it out and then tell someone else, and so on. But what if multiple users from the same team use the same login? How do you make sure that all the users get the full, unforgettable first-time user experience, and then proceed to become promoters of your product? The answer lies in creating a user experience that works into your user's natural daily rhythm. In order to make your product “sticky”, you need to find out how your product fits into your ideal user’s day. How are they currently using your product? Where are the opportunities to encourage individual account creation? For example, when Crashlytics encountered this problem, we decided to find out about our user’s natural workflow. We discovered that, as part of their daily routine, developers would check in their code at least once per day. The first time user experience is as key to your product’s success as any feature of your product, if not even more important since it is the very first feature your users will interact with. While this user-centric approach requires more resources in order to pull off successfully, it pays off in huge dividends. 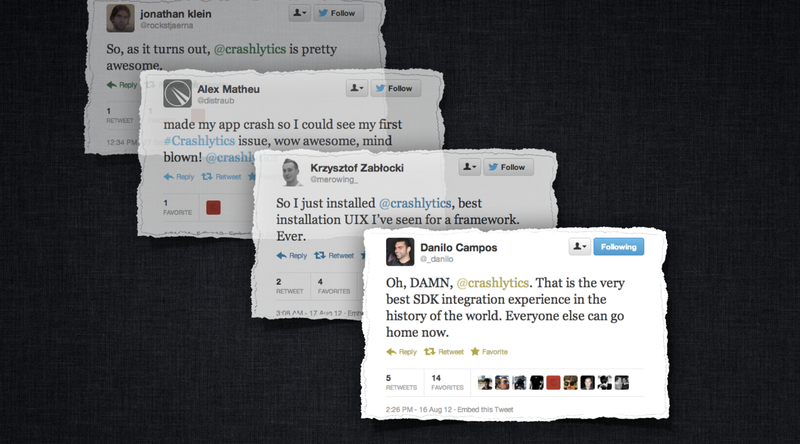 Using this approach, Crashlytics was able to rank #1 in mobile performance within a year of launch. In fact, we had more usage than the platforms sitting at #2 through #6 — combined. Because when you focus on making something lovable, the product speaks for itself.